Biamp Systems, a provider of networked media systems, has installed a Audia/Nexia audio solution combination in the newly built Energy Systems Integration Facility (ESIF) at the National Renewable Energy Laboratory (NREL) in Colorado. The architectural firm of record, SmithGroupJJR (SGJJR), engaged Convergent Technologies Design Group to design an audio solution to fit the distinct needs across the varied spaces. Audia and Nexia's flexibility and modular DSP architecture allowed Convergent Technologies to design the best audio solution for the new building. "Early involvement in a project is key," shared Paul Corraine, president of Convergent Technologies Design Group. 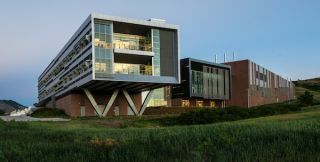 "Our long relationship with SmithGroupJJR enabled us to forecast and creatively solve for many unique needs the NREL had, while developing a seamless technological solution." "Biamp is excited that we could help facilitate an audio solution for the design team at CTG and SmithGroupJJR," stated Michael Frank, mid-Atlantic regional manager for Biamp Systems. "We're committed to providing our consultant and integrator partners the equipment and services to deliver innovative audio systems."